Henry and I took the MetroNorth train (Henry’s first time in Grand Central and on Metro-North) to Fairfield, Connecticut to visit Jessica, Gray and Isla Burn. Jessica and Gray’s baby, Isla was born in June 2012, so she and Henry are not too far apart. Although in baby time, it is pretty amazing what a difference even two months makes as far as development. Isla is almost eating two solids a day while Henry is still drinking his food. It was fun for the two kids to meet and it was nice for me to catch up with my good friends. Here are some photos of the two just hanging out. Many forced poses by parents, of course. Henry and Isla meet for the first time. Henry stares at Isla, and yes, that is a lot of spit up on Henry’s shirt. Henry and Isla stare at each other. This hand holding pose was not forced. 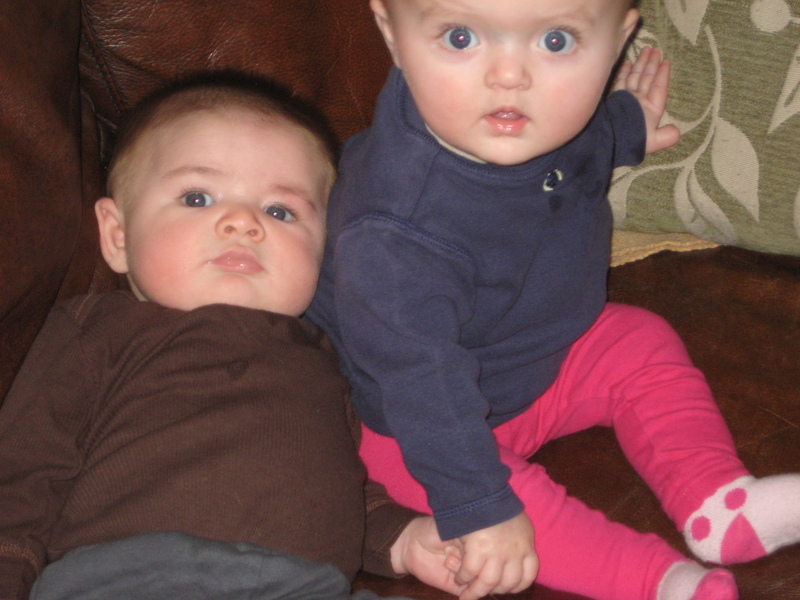 Henry fell into Isla and it looked as though she was trying to hold his hand. What a flirt. This entry was tagged Connecticut, daytrip, Isla, train. Bookmark the permalink. Henry & Isla are adorable together, both of them beautiful babies! Love the one of them holding hands. Glad you got to visit & catch up with your friend, Jessica and her adorable baby girl.